"There has been speculation among geoscientists for decades that some underwater volcanoes form because of fracturing," said Professor Dietmar Muller, from the University of Sydney's School of Geosciences and an author on the research findings published in Nature Geoscience today. "But this is the first comprehensive analysis of the rocks that form in this setting that confirms their origins." It has long been accepted that as the Earth's plates move over fixed hot spots in its underlying mantle, resulting eruptions create chains of now extinct underwater volcanoes or 'seamounts'. One of the most famous is the Hawaiian-Emperor chain in the northern Pacific Ocean. The seamounts of that chain are composed mainly of ocean island basalts - the type of lava that erupts above hot spots. But north of the Hawaiian chain, in a formation called the Musicians Ridge, researchers found samples from seamounts that were not made up of the ocean island basalts you would expect from plates moving over a hot spot. "The oldest part of the Musicians Ridge formed approximately 90 million years ago from hot spots but these new samples are only about 50 million years old and have a different geochemistry," said Professor Muller. "They did not form because of a hot spot but because of plates cracking open at their weakest point, allowing new magma to rise to the seabed and restart the formation of underwater volcanoes. They are near extinct hot spot volcanoes because that hot spot action millions of years earlier helped weaken the crust (the layer directly above the mantle) where new volcanoes now form." Vulnerable spots in the Earth's plates crack when they are stressed, in this case due to movement of the Pacific Plate which started to dive or submerge back into the Earth's crust at its northern and western edges around 50 million years ago. The formation of these younger seamounts caused by the deformation of the Pacific Plate at its margins suggests a link to the unique bend in the Hawaiian-Emperor chain. 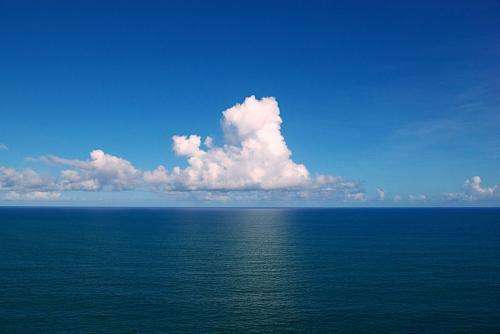 "We believe tectonic changes along the margins of the Pacific Plate around 50 million years ago put the weakest points of the Pacific Ocean crust under tension and created the youngest Musicians Ridge seamounts," said Professor Muller. "It also caused the flow in the slowly convecting mantle under the Pacific to change dramatically, to the point that the Hawaiian hot spot in the Earth's mantle changed its position. "The resulting seamounts along the Hawaii-Emperor chain changed their position accordingly and the bend was born." This work provides a solid foundation for understanding other 'non-hot spot' volcanism seen elsewhere, for example the Puka Puka Ridge in the South Pacific. Might make sense to look for a "trigger" in that time span, such as a large meteor impact somewhere on Earth to explain how the fracturing went millions of years without incident and then suddenly reawakened. Forty million years from formation of the fractures to new volcanism is a long, long time and I'd expect the requirement of some massive events to trigger it awake again. Maybe there was an exceptionally massive earthquake near Japan or Alaska which could stress the center of the plates enough to cause the reactivation of the fractures. in comparison, the Grand Canyon and even Yellowstone are only a few million years old. Or maybe, you could just re-read the article and understand that the authors already addressed the mechanics of those events, and that the combination of a large, active, convective cell and plume, working in conjunction, are sufficient in themselves to initiate subduction, flexing/ fracturing of oceanic crust, modification of convection and repositioning of the plume. No need to invoke any miraculous asteroid impact or magnitude 40 ultraquake to trigger those processes. The Grand Canyon and Yellowstone's ages are immaterial.